Through excavation of a site in Texas, researchers have identified a particular style of projectile point – or triangular blade often attached to a weapon that would be thrown- dated between 13,500 and 15,500 years ago, they say. This is earlier than typical Clovis-style technologies dated to 13,000 years ago. The finding suggests that projectile points changed over time from the stemmed form found here into the more widespread, Clovis-style lanceolate fluted projectile point. It’s also possible, say the study’s authors, that the projectile point style they found in Texas is a distinct style created by people of an earlier, separate migration into the Americas. Clovis points – thought to date as early as 13,000 years ago – were once thought to reflect the earliest occupation of North America. However, more recent excavations in western North America have identified a different style of point technology- the Western Stemmed Tradition. The connections between the artifact assemblages of Clovis and Western Stemmed Traditions, however, remain unknown. 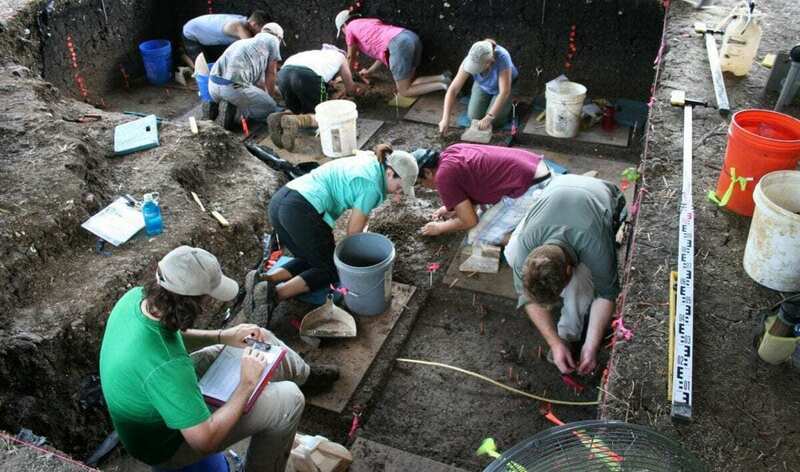 Here, Michael R. Waters and his colleagues report more than 100,000 artifacts, including 328 tools and 12 complete and fragmented projectile points, excavated from the Buttermilk Creek Complex horizon of the Debra L. Friedkin site, which dates earlier than the Clovis history. From 19 optically stimulated luminescence dates of sediments, they determined the artifacts were between 13,500- and 15,500- years-old. The Buttermilk Creek Complex featured bladed projectile points that exhibited similarities to artifact assemblages of the Clovis, with lanceolate features. Waters and colleagues suggest that once developed, the lanceolate fluted point technology (associated with Clovis) could have spread over much of North America into northern Mexico, or alternatively, the stemmed and lanceolate point traditions may be evidence of two separate human migrations into North America.